BHT, butylhydroxytoluene, is a fat-soluble substance recognised for its powerful antioxidant properties. It is widely used as a preservative in food-processing to prevent rancidity in certain foodstuffs containing various fats or oils. It is currently the focus of renewed interest due to various studies that have highlighted its remarkable properties. ¤ The free radical theory of ageing suggests that constant exposure to oxidative stress generated by UV light, cigarette smoking or various sources of ionising radiation, is largely responsible for the body’s decline. When mice are persistently subjected to low-dose radiation, the resulting changes are similar to those observed in ageing. ¤ Dr Denham Harman from the University of Nebraska proposed this theory back in 1956. His preliminary experiments with various molecules resulted in an approximate 20% increase in the lifespan of mice. In a second series of experiments, the results of which were published in 1968, Harman tested the effects of BHT and a number of other substances known to inhibit free radical-generated effects, on ageing and life expectancy. Some of these experiments showed a clear link in mice between lifelong administration of BHT and increases in lifespan of between 30% and 50%. ¤ Harman thus showed that potent antioxidant substances like BHT could protect against certain factors impacting on life expectancy such as genetic susceptibility to cancer, poor diet and radiation. ¤ A team of researchers also exposed mice to low levels of radiation and discovered that the changes that would normally occur were prevented by the administration of BHT. These and other findings suggest that BHT may play an important role in extending lifespan. ¤ BHT’s significant antioxidant potency thus confers considerable ‘anti-ageing’ benefits which protect against the harmful effects of UV rays, smoking and ionising radiation. ¤ Some doctors use BHT in clinical practice to relieve the symptoms of the Herpes simplex and shingles viruses. ¤ In fact, BHT has been shown to be remarkably effective at inhibiting or inactivating a number of viruses that have a lipid membrane, including herpes. Lesions in herpes-infected mice treated with BHT healed faster than those of controls. When BHT was added to rabbits’ diets, it reduced the severity of herpes as well as mortality rates from eye infections. ¤ In a double-blind human study, sixteen patients with advanced herpes, treated with an external solution of BHT, saw a slight but definite improvement compared with a control group. ¤ In another trial, BHT led to total remission in the majority of the 150 herpes patients treated. ¤ Topical application of BHT was also effective at reducing symptoms of shingles, producing a rapid decrease in pain and accelerating healing of skin lesions. ¤ BHT is also particularly effective against a number of viruses due to its ability to inhibit or inactivate viruses that have a lipid membrane. Russian studies have also reported its efficacy against the flu virus. ¤ Indeed, this particular characteristic suggests BHT may be beneficial to HIV-AIDs patients since HIV has a lipid membrane. ¤ According to scientists, BHT may be able to eliminate the lipid ‘shields’ of viruses, or make them permeable, enabling antibodies to successfully attack the viruses. Another hypothesis suggests it may suppress a protein in the virus’ coat, preventing it from attaching itself to a healthy cell in order to replicate. ¤ Initially, BHT was not recommended for people suffering from hepatitis (A, B or C) because of its presumed hepatotoxicity. However, a body of evidence now suggests it may be effective at treating this disease. Indeed, a study in which a hepatitis C patient was treated with high doses of a combination of BHT and hypericin (a key constituent of St John’s Wort) showed that the treatment enabled a return to normal, negative values as shown by blood tests carried out at regular intervals. As BHT is fat-soluble, it should be taken with a meal that contains some element of fat (vegetable oil, cheese, butter or margarine) in order to improve absorption and bioavailability. The protective and anti-ageing effects of BHT can be boosted by combining it with other antioxidants such as vitamin C. You may be interested in the supplements Asc2P and Liposomal Vitamin C which are even more powerful than the standard form of vitamin C (L-ascorbic acid). They are both stable, potent and highly-absorbable forms of vitamin C. Discover too Coenzyme Q10 (CoQ10), a powerful antioxidant with cardio-protective effects. 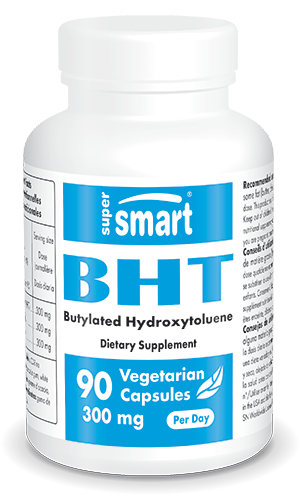 Warning : At high doses, BHT prevents the breakdown of alcohol and thus increases its harmful effects on the body.